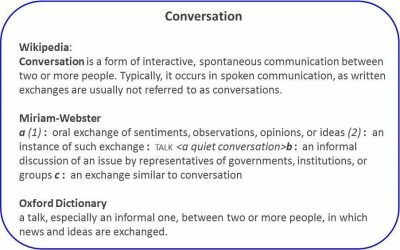 With all due respect to these highly-respected sources, I’d like to suggest that such “definitions” of conversations are far too limited … not incorrect as such … simply far too limited. Life is far too complex to reduce its core interactions to definitions. A few weeks ago, in a meeting with a group of scientists and engineers, I mentioned the concept of conversations with oneself. One member of the group guffawed, suggesting he was a long way from being schizophrenic: a defensive reaction, which of course is fine. After all, in our technocratic western world, it seems perfectly normal, if not necessarily wise, to reject what we don’t understand. We hold such conversations before making any decision. What shall I wear today? It looks like it might rain: should I take an umbrella? Sitting in a restaurant: what should I eat? Whenever someone says something that causes an emotional reaction, a conversation within us begins. 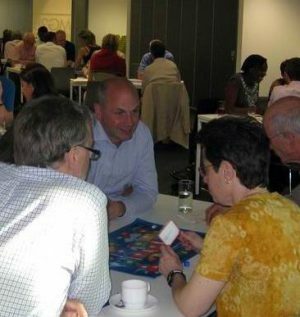 A group of people in a room sitting in a circle in silence … Within this group there is a continuous stream of conversations, both conscious and unconscious. When we enter a space, our intuition begins a conversation, indicating the degree of comfort we feel. When we come into a space populated by others, our intuition begins a conversation, indicating the physical distance that feels appropriate to different members of the group. And they are having the same conversations. When we encounter another human being who awakens within us associations of other people, an emotional conversation begins … in our gut. These conversations are neither linear nor solitary. All occur within a context, in a specific time frame during which we are having countless additional conversations about a range of other aspects impacting our life. And in addition, we may be in a face-to-face conversation with one of more other human beings. Conversations are far too complex to reduce to a simple definition. They leverage and inform our lives at multiple levels simultaneously, continuously.